Acronis Hardware Compatibility Tool for Tape Devices checks whether a particular tape device is supported by Acronis Backup Advanced. The tool works with tape devices in the way Acronis Backup Advanced does and performs a set of tests on tape drives and loaders (robots). 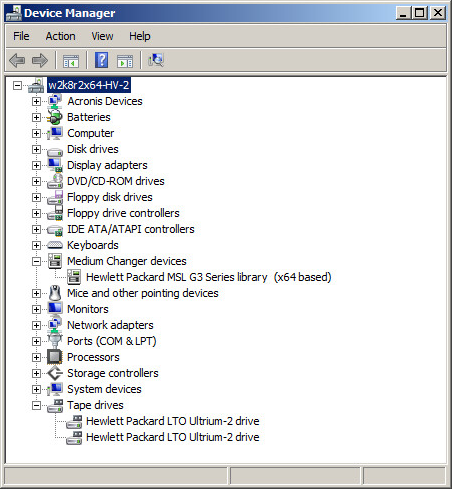 Ensure that the drivers are properly installed and the devices (robot, drives) are shown in Windows Device Manager. Press Enter if you want to test all devices or type the number of a particular device. Once the devices are specified, the tool will ask you to configure a set of tests. To choose a test, type Y (Yes), N (No) or C (Close application). Note: the specified size for read/write test should not exceed the capacity of single tape media. When all the tests are completed, the tool will save the results into the same folder from which the tool was launched.